8. 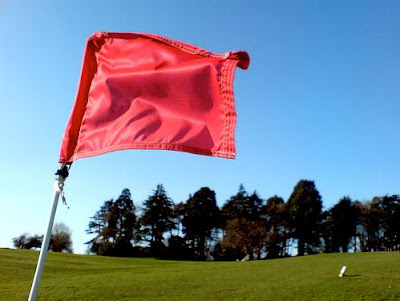 Ask anyone, other than your playing partner, as to the direction of the wind - Rule 8-1. Well, it seems as though I am wrong, although I have not been given any conclusive evidence from the Rules or Decisions. However, I do respect and value the opinions of those who have more experience of these matters, who collectively assure me that discussing weather conditions with your fellow competitors does not incur a penalty. ‘Advice is any counsel or suggestion that could influence a player in determining his play, the choice of a club or the method of making a stroke. The penalty is two strokes in stroke play or loss of hole in match play. The reasoning is that any conversation regarding wind conditions is public information and does not constitute advice. However, as soon as a player says anything directly relating to club selection for the next stroke he is likely to be breaching the Rule. It is a fine line and a little subjective, but then that applies to many of the Rules. Apologies if I confused you with an incorrect tip, which I have since corrected on the original post. Author of the book, ‘999 Questions on the Rules of Golf’ – the easy way to get to know the Rules better. You say "playing partner" giving or asking for advice. You are talking about the opponent in a match or pairing for stroke play, correct ? You are allowed to ask advice from your team partner. What I said in the original tip was "other than your playing partner". Of course, you may give advice to or seek advice from a plying partner, because they are on the same side as you (as in a fourball or foursome). I have now edited the post to clarify that Player B in the six examples is a fellow competitor or opponent.